Extrifit® Vegan 80 – protein isolate exclusively from plant sources! Lactose-free! The excellent alternative to whey and milk proteins. This top plant isolate has perfect parameters. Extrifit® VEGAN 80 contains up to 75% of protein and up to 5000 mg of BCAA in one scoop in comparison with various plant proteins that you ever met. It means it is absolutely equal protein source to whey proteins with practically the same amino acid content – so it is very suitable for muscle mass growth and building. If you are looking for an alternative to whey proteins, VEGAN 80 is the right choice for you. VEGAN 80 excels in very low fat content and zero sugar content. So it is suitable also for very strickt diet and during cuting. 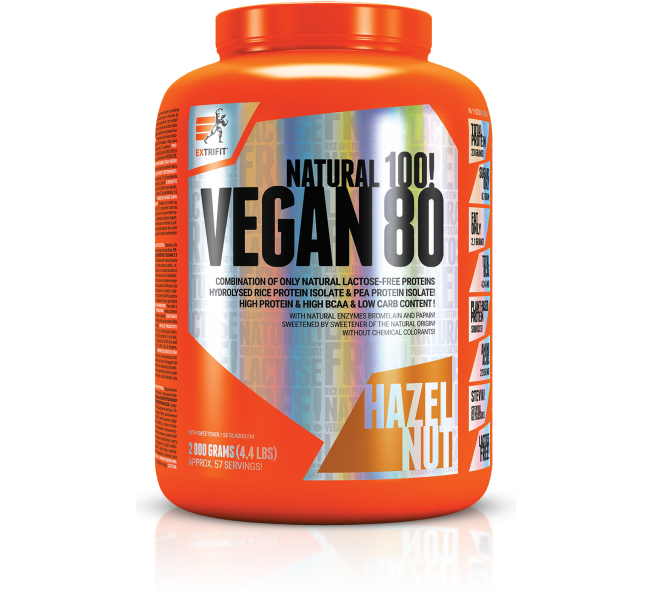 VEGAN 80 contains two plant protein sources: rice protein isolate and pea protein isolate in the ratio 1:1 and it is enriched with natural enzymes bromelain and papain. VEGAN 80 does not contain any lactose so it is very suitable also for consumers suffering from its intolerance. VEGAN 80 does not contain any colorants, thickeners and any other additives! Intake of this high quality protein can increase muscle mass growth and prevent from muscle catabolism in danger of that. Depends on your body weight, sports activity and diet. We recommend dividing the daily dose (2-6 scoops) into two or three portions.